This is one of the last cartoons I drew for QST some years ago, and it’s one of my favorites. I don’t remember the exact details of the article it accompanied, but I do remember the set-up: Some poor amateur had worked so much public service that he eventually lost his mind, so much so that at his final assignment he mistook a fishing rod for a handi-talkie and started barking status reports into it. Anybody else been in his predicament? I haven’t — yet. 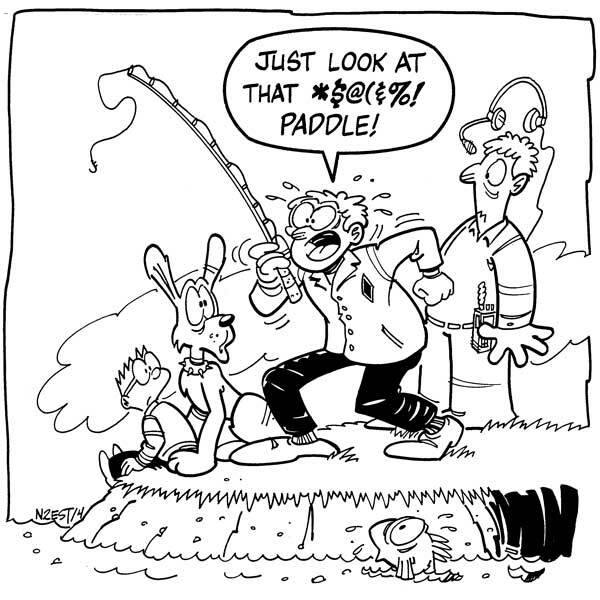 This entry was posted in Throwback Thursday and tagged amateur radio, ARES, ham radio, ham radio cartoon, ham radio humor, Hamtoons, N2EST, public service, QST, Throwback Thursday. Bookmark the permalink.